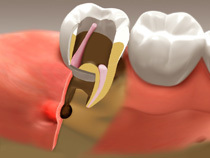 Dental pulp is located within the center of each of your teeth. 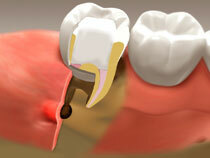 This soft interior contains a nerve that extends from your tooth’s root, relaying vital nutrients to the tooth. 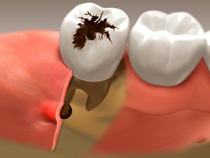 If a tooth’s pulp is damaged, or suffers from an infection, the nerve within the pulp will eventually break down and, unless a quality endodontic treatment (root canal) is successfully implemented, the tooth may also wither away. In general, the removal of the nerve tissue in the tooth, or root canal, can salvage injured teeth by correcting tending to problems within the tooth, in order to avoid removing it. 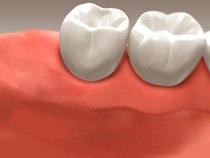 Once the root canal procedure is completed, completely restoring the tooth using a dental crown is highly recommended in order to preserve the tooth’s newly repaired internal structure and adding chewing power. Whilst the operation is underway, your dentist drills a gap through to the tooth’s crown and pulp chamber and removes or reshapes all traces of diseased pulp. 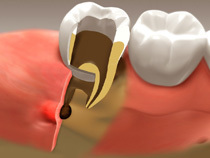 The tooth is then permanently sealed with a gold, porcelain, or tooth-colored inlay, onlay or crown.